*If your roast comes tied with string, leave it on for the entire cooking process. Let your roast sit out to room temperature for about 30 minutes before cooking. Peel and Slice your onion. Add your butter to your instant pot on the saute setting, add the onions and saute until golden brown. Remove the onions from the Instant Pot. Rub the roast down with some vegetable oil and season on all sides with garlic salt and black pepper. Add the roast to the instant pot that is on the saute setting and sear on all sides for about 5 to 7 minutes each side. Add the onions back to the instant pot and add the water and the bouillon cubes. Set the instant pot to the manual setting, high, 40 minutes. While the roast cooks, add the mustard, the rest of the vegetable oil, the brown sugar, carawy seeds, cinnamon, and parsley to a bowl and stir to combine. Pre-heat your oven to 450 degrees and prepare a roasting pan by spraying it with some non stick spray. When the timer goes off on the instant pot, let the roast sit without releasing the pressure for ten minutes. After ten minutes, quick release the remainder of the steam and remove the roast from the pan. Place the roast in the baking dish/roasting pan you prepared, and brush it all over with the mustard glaze you made. Place in the oven for 10 to 12 minutes until the glaze and outside layer is crispy. 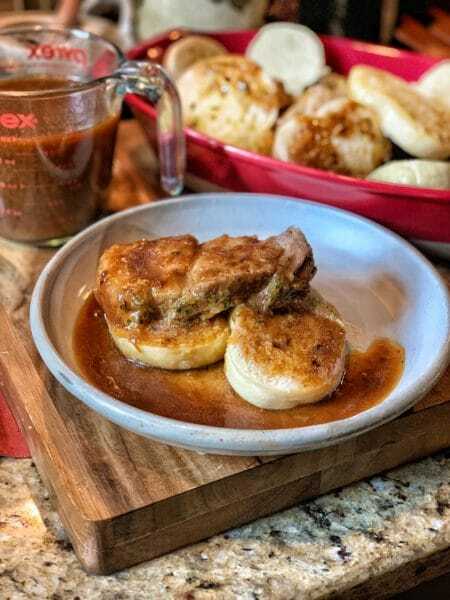 While the roast bakes, place your thawed bread dumplings loosely in foil, place on the rack in the instant pot and set the IP to the steam setting for ten minutes. Remove your roast from the oven and let it rest for 10 to 15 minutes before slicing. Remove the dumplings from the IP and the rack, set the IP back to saute, bring the liquid to a low simmer and add the pork gravy envelope. Whisk until combined and the gravy is thickened. If you need to thicken the gravy, make a slurry with the corn starch and the water and slowly add it to the simmering pot of gravy. Slice your pork roast, top each dumpling with a slice of the pork, and pour the gravy over the roast and the dumpling.